This post has been pulled, and an explanation will follow. Don't worry, we haven't been shut down. We're just working out the details of a new editorial process that I think will help with the consistency of the product. It's all part of that "Rules Which Must Be Followed" thing. I think this article is enough to make the hair on the back of my neck stand up and the stomach to turn! Here's wishing all of you home safely when your deployment is over. You have an amazing way with words. This blog brought a tear to my eye (many tears). Reality has struck. Stay safe!! I was speaking only this week about 'Bull' Halsey and his terrifying trip into Typhoon Cobra. His famous dictum "Hit Hard! Hit Fast! Hit Often!" still ring true. I always thought of him as the Naval version of Patton. We also decided an updated version of his war strategy should be "Kill terrorists!" Keep your powder dry and good hunting. Watch the horizon and the weather. The groundhog day you knew may deceptively seem similar but in all likelihood will be different this go around. Keep the training hard and relevant. Ignore the temptations of the long reach of admin puke hell back Stateside. It CAN wait. Sail safe and shoot straight! Godspeed Lincoln CSG & good ship Russell. Thank you for what you all do everyday! The West-Pacs of the early '80s on a leaky, rusty old Adams class DDG! The stuff of dreams for a young sailor, Olongapo, Pattaya Beach, Pusan and British Hong Kong. And the dreaded IO cruises where Diego Garcia was the only port. I'm so glad I served then, even if mail calls were few and far between. I imagine the ports are so different now, more like Diego Garcia than Olongapo. The beauty of the starry nightime skies may still be there but much else has changed, I'm sure and not for the better. Fair winds and following seas as you traverse the ditch. Keep the sand out of your skivvies. Stay your course and let the dreaded foe steer shy. Put your rounds on target. Bring the fight to the terrorists! BZ and heartfelt thanks for doing the job I'm too old to do. XO - You are a very powerful writer. I read your original post this morning, the honesty was refreshing. Stay safe and know you are in our thoughts and various prayers. Thank you for keeping the Lincon CSG safe. Your original post was most welcome. Frankly, about the only things the Navy need worry itself about is plans for weapons, software code and ship & sailor positions being released. This last post should never have been a problem - all we knew as readers is the ship was somewhere in the Persian Gulf, serving as one of too few Damocles' Swords against Iran and as a real weapon against terrorists. Well was said: Nuts! And dammit, we are proud of you in America. Very proud and t'd off at your suppressors. It wasn't pulled because of security concerns, and like I said, we're not going away any time soon. As mentioned before, we're breaking new ground and building policy and process from the ground up. This post came down for dull procedural issues and we're working a new scheme to try and prevent similar events in the future. Thank you for creating this blog. It will be an educational tool for some, and an emotional lifeline for others. I fall under the heading of a person who will read for emotional reasons. You have my most precious cargo on board the USS Russell: Ens. K.T. Borromeo is my daughter. It was great to see her at the table during the March birthday dinner. God bless you all. May the nautical star guide you safely in the Gulf and back home again to the islands. Your blog is now famous. A story about it from the Honolulu Advertiser dated 28 April showed up on the Chief of Naval Information (CHINFO) Clips on 29 April. For people - like me - working inside the Beltway, the description of the disappeared post is a sobering reminder of what it means to "take risk" with funding personnel and maintenance accounts. Keep up the good fight. Resolve your dull procedural issues and provide as much realism as you can. I sure wish I have visited early enough to read the full original post. Love this blog. My nephew is serving on the USS Russell so I read it every day. I am also a teacher and I use it in my class every week. My school would like to send letters and cards to the sailors and my students would like to send cards and a banner to you guys. How do I send the letters? Do I need to send each letter individually or can we send one package and have the letters distributed? You have found a way to communicate what we, stateside, need to know. Congratulations. 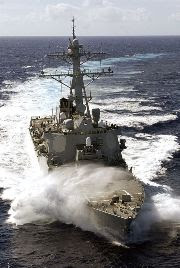 We can't be there, except in spirit and support as the USS Russell does serious and important work for the nation. Do not let the periods of tedium wear down your readiness. The Iranian Revolutionary Guard will be testing your discipline as they send speedboats close aboard. Keep your mine detection ears and eyes alert if you go through Hormuz and into the Gulf. Remember the lessons of the Van Riper exercise. Every day you are accomplishing good things under the flag of liberty. Your eternal vigilance is its price.